The Supreme Court of Tennessee’s Access to Justice (ATJ) program recently joined forces with Legal Aid of East Tennessee (LAET) to honor attorneys who earned the Court’s prestigious “Attorney for Justice” recognition in 2017. The distinction is given to Tennessee attorneys who provide a minimum of 50 pro bono, or volunteer legal, service hours in a calendar year. This year approximately 330 attorneys will be honored across the state. 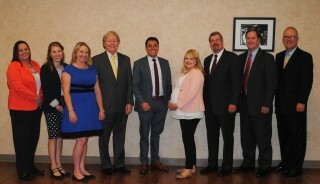 On October 13, attorneys from the Tri-Cities area were recognized at The Press Room in Kingsport. Those recognized include: Karen Boyd (Kingsport), Curt Collins (Greeneville), Michael Forrester (Kingsport), Rachel Mancl (Johnson City), Kristi Murray (Johnson City), Tony Seaton (Johnson City), Brent Young (Johnson City), and law student Sarah Blessing (University of Tennessee). Tennessee Supreme Court Justice Roger A. Page attended the event and shared personal stories of pro bono services provided by his wife and himself back when he was an attorney. Quoting former U.S. Supreme Court Justices Sandra Day O’Connor and Antonin Scalia, Justice Page thanked attendees for sharing their talents and giving their time to the people of East Tennessee. Supreme Court of Tennessee Chief Justice Jeff Bivins and Legal Aid of East Tennessee Executive Director Sherri Fox also attended and spoke at the event. At the event, Fox read from the many comments received by clients receiving pro bono legal services including, “you put a face on a sterile, overwhelming system,” “you made me realize there are great people left in the world,” “I am proud to be represented by an attorney,” and “it made me feel like someone cares about the elderly.” Many clients receive free legal services at clinics held throughout East Tennessee during the year. October is Pro Bono Month, a time to highlight the need for and importance of pro bono civil legal assistance to disadvantaged people. While many people understand the constitutional “right to an attorney,” that right only applies to certain criminal cases and does not apply to civil cases, including evictions, bankruptcies, divorce, child custody, and more. Each year, more than 60 percent of disadvantaged Tennesseans have at least one civil legal problem and nowhere to turn. In 2015, Tennessee lawyers provided more than $100 million worth of free legal services, ranking the state as one of the top in the nation for access to justice. For more information on pro bono service in Tennessee, visit justiceforalltn.com.